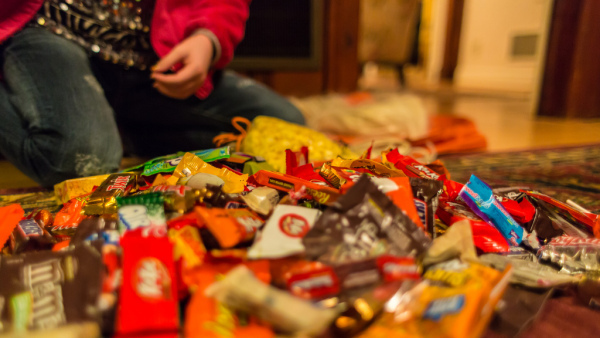 Halloween is back, and with it, a mild to moderate amount of stress for health conscious parents who worry that after all the treats, the “trick” will be… cavities! Fortunately, after 15 years practicing as a family dentist in Eugene, Dr. Feldmanis is ready with some salient tips for overcoming the Halloween holiday jitters, and some of them are surprising! Believe it or not, allowing your child to tear through her Halloween candy in one frenzied, werewolf-inspired, wrapper-tearing candy gorge is actually better than allowing her to gently nibble for hours and days on end– at least, as far as her dental health is concerned. Why? Well, regardless of the amount of sugar, what matters in terms of oral hygiene is how long her teeth are exposed to sugar. When your child is eating candy, the sugars in that candy aren’t just taking up room in his stomach before his nutritious dinner is served. Those sugars are also feeding bacteria– and the bacterial byproduct of sugar is acid. Acid eats away at tooth enamel, and eventually, can form cavities. So while it may seem crazy, eating all the Halloween candy in one go actually limits exposure to sugar in the long run. It may, however, be responsible for a wicked stomachache. One thing that often gets missed is the type of candy kids eat– it turns out that not all candy is created equal when it comes to dental health. Try to avoid chewy, sticky, or tacky candy that creeps into the darkest corners of your mouth and lingers, feeding cavity causing bacteria– Laffy Taffy, while delicious, is one example of this. “Hard” candy that requires prolonged sucking is also bad because it’s basically bathing your mouth in a bacterial energy shake. A little surprisingly, “sour” candy can be especially harmful because it changes the oral pH of the candy-eater to an acidic environment. An acid environment wears away our tooth enamel, and too much exposure to acid can actually cause cavities! So how to avoid these sugary pitfalls on Halloween? One way would be to eat chocolate instead– yep, you heard us correctly. Chocolate melts in your mouth, instead of sticking around to feed bacteria, and if you really want to be sold on it, chocolate does have anti-oxidants. To ward off the worst, we suggest “buying” your children’s least-dental-friendly candies with his or her favorite chocolate treat. Whenever your child does have a treat, make sure they’re brushing and flossing right afterward. This is a great opportunity to practice good oral hygiene, and it may even discourage them from overeating. Don’t forget to educate your child about how candy can harm their teeth so they understand why oral hygiene is so important, and encourage them to drink lots of water— that helps wash away sugars. Apply these tips, and you may be surprised by how easily your family’s dental health sails through the Halloween holiday unscathed. For more information on caring for your child’s dental health during holidays, or anytime, call or visit Dr. Feldmanis– your family dentist in Eugene, OR.